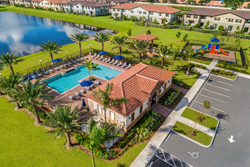 Lennar’s Cambria Parc in Boynton Beach recently celebrated the anticipated opening of its community amenities with a special event in late October. The modern townhome community is designed for young couples and families with maintenance-free living and an ideal location close to the action of Delray Beach and Boca Raton, at a much more affordable price point. Top South Florida homebuilder Lennar recently held a successful grand opening for the fantastic amenities at its modern Boynton Beach townhome community – Cambria Parc. A special launch event on Oct. 21 unveiled the community’s gorgeous swimming pool, cabana, gazebo and community park. Current and prospective residents spent a fun afternoon enjoying the newly-opened amenities, along with complimentary refreshments and brief remarks from Lennar representatives. Specifically designed for professional young couples and families, Cambria Parc’s vibrant community offers hassle-free living and perfectly situates its residents just minutes away from Delray Beach’s lively downtown and Boca Raton’s renowned shopping and dining, but at a fraction of the cost. Priced in the $300s, Cambria Parc’s new construction townhomes offer modern and sophisticated two-story designs with attached garages, three to four bedrooms, two-and-one-half to three-and-one-half bathrooms, and up to 2,203 square feet of living space. All homes feature Lennar’s famous “Everything’s Included” package, which means that premium finishes, appliances and fixtures come standard to help buyers complete the elegant look of their brand-new homes. For a limited time, those interested in purchasing a townhome at Cambria Parc can also enjoy savings of up to $30,000 on select move-in ready homes. Located at 5440 Flavor Pict Rd, Boynton Beach, FL 33436, the Cambria Parc Welcome Home Center is open 10 a.m. - 6 p.m. daily, with model homes available to tour. For more information, interested homebuyers and realtors can call 866-424-0264 or visit https://www.lennar.com/new-homes/florida/palm-beach/boynton-beach/cambria-parc. Lennar Corporation, founded in 1954, has positioned itself as South Florida’s #1 New Homebuilder by providing quality products, the best customer service and attention to detail throughout the entire process of purchasing your home. Lennar offers more than 22 communities spanning Broward, Palm Beach, Treasure Coast, Brevard, and Escambia County. Each is built to the highest standards of quality and design, characteristics of the brand that is Lennar. Providing an exceptional customer experience and facilitating the home buying process are always top priorities. Lennar and its subsidiaries offer customers the full scope of all financial services, including mortgages, title, and insurance. Previous press releases and further information about the Company may be obtained at the "Investor Relations" section of the Company's website, http://www.lennar.com.